Exact Editions Blog | Free Magazine Apps: What do they Achieve? Free Magazine Apps: What do they Achieve? Time.com the web site for that great magazine Time has recently released a Free App for the iPhone, which you can obtain here. It is one of the best Free Magazine Apps that I have tried. I am highly impressed by the design and software intelligence that has gone into building this App. But one has to question the fundamental business strategy. Why distribute an App for free which does nothing to help to sell subscriptions? Maybe I missed something, but I found no link or information on any part of the App about buying a Time magazine subscription, either in print or in digital format. If you are going to distribute a free App which gives a thin/medium thick layer of content from each issue of the magazine you really must offer an iPhone App which gives a subscription to the whole magazine. This Athletics Weekly video shows how subscriptions to magazines can be sold through the App store. My guess is that giving away 10/15% of the content of the magazine does not seriously undermine the value of the subscription in print form, but one has to question the advisability of giving away, via the App, content which is going to appear in next week’s print issue (eg a news story from today about Afghanistan). What is this real time generosity telling Time’s print subscribers, who are increasingly the life blood of the magazine? What about the advertising? 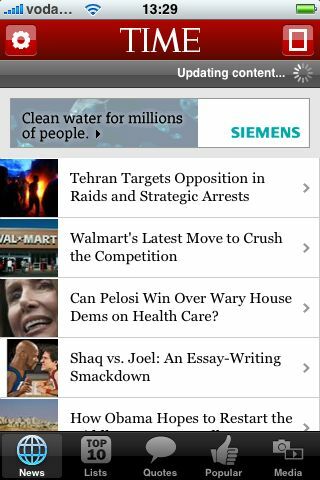 Perhaps the real point of this excellent App is to generate advertising revenues, and one notices that Siemens ads appear throughout the App and are credited on the web site with sponsoring the venture. We have no idea how much Siemans will have paid for this privileged position, and there is no way of telling whether this sponsorship is really additive, or coming at the expense of additional revenue to the existing web accounts. There is no way of telling, but the lack of visual punch in the in-App Siemens ads, and the fact that Apple release very minimal demographic data, tells me that the advertising prospects for Apps of this style cannot be great. The bald truth is that magazines are repeating with their free magazine Apps, the mistake that they have been making with their web sites. In most cases the web strategy has come unstuck. 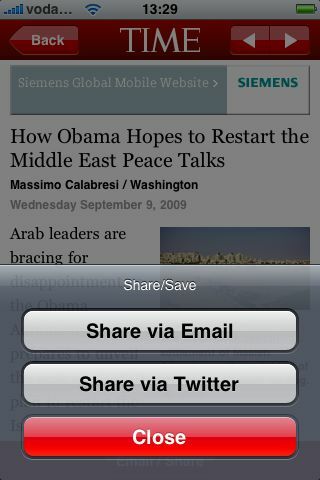 And these Apps, which are essentially re-packaged RSS feeds from the web sites, are not going to help at all. Partly because of the demographic obscurity of the Apple customers. It is not a good idea to give away content on the web or through the App if this is undermining the value of your core subscriber proposition. Advertising-funded web and App developments will only work for magazines that have tremendous reach, or a very high value audience. There are very few of them. It is becoming increasingly unlikely that any magazines fit that bill. Time should really be building its subscriber base with its App. Magazine publishers have gradually learned that a lot of their subscriptions do come through purchases made on the web. It is time that they drew the obvious conclusion that subscriptions to digital magazines will also be purchased through the web and through the iTunes App store. Exact Editions will be pleased to help Time to develop a branded App for Time magazine (not Time.com) which will enable any iPhone/iTouch user to purchase a subscription to the entire and visually compelling magazine….